I am always interested in global projects and lately there have been several that have caught my eye. 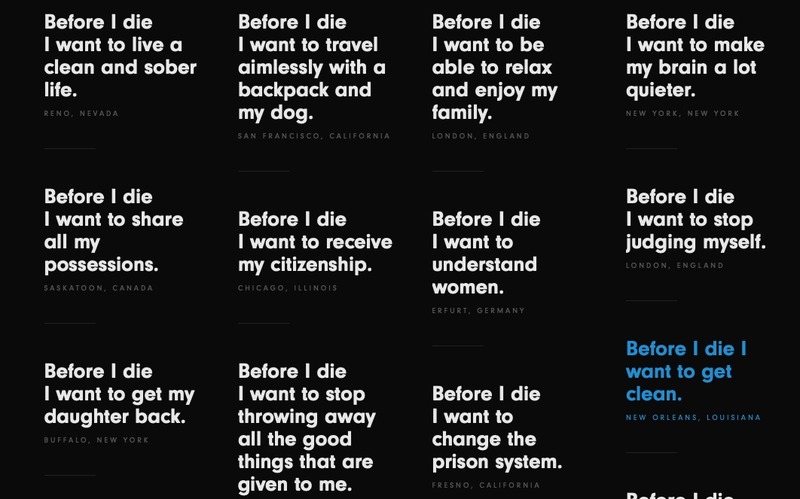 One in particular is the Before I Die Project. 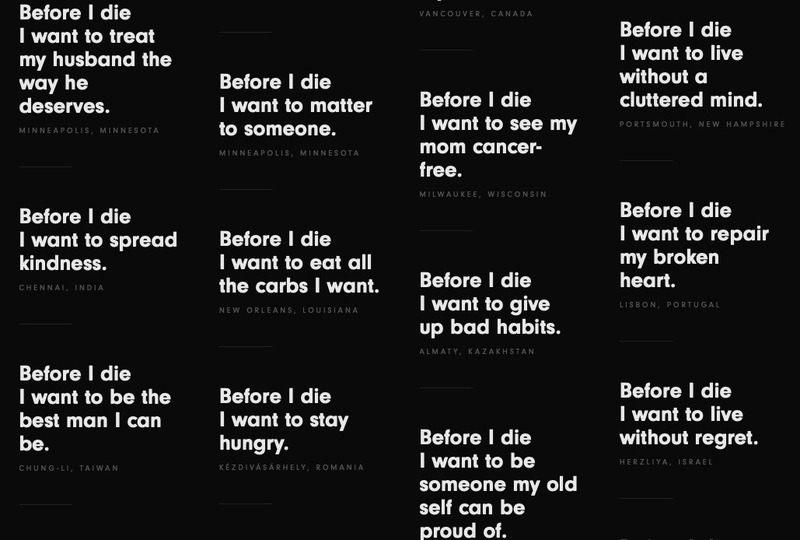 Before I Die is a global art project that invites people to contemplate death and reflect upon their lives. Created by the artist Candy Chang on an abandoned house in New Orleans after she lost someone she loved, today there are over 4,000 walls around the world. I was intrigued and it got me to thinking about what I would write on a wall if provided the opportunity. I took some screen shots of some of the phrases that appeared on their website of examples of what people have written on various walls around the world. A lot have to do with personal goals. It’s easy to read between the lines, isn’ t it? Humans suffering. I see so much sadness and regret in some of these sentences. But I also see hope. See my mom truly happy for one more time. Make a difference in someone’s life with a simple act. See more of this amazing world we live in. So…you knew it was coming. If you could finish the sentence Before I Die…. Let me know in the comments and remember each comment this month means a 50 cent donation to our Comments for a Cause — Dementia Society of America. You can read more about that here. Next → Need a Book Recommendation? Here Are a Few to Consider. What a neat idea. There are some good ones there too. I loved…read all the books I own! Without thinking too much or too long this is what popped in my head. Before I die I would like to see my children, grandchildren and great grandchildren happy and living productive lives. Yep–that would be what I would write as well! A lot of them were sad comments but I am sure there are a lot of positive ones as well that I just didn’t screen shot. I agree with Darlene and you — seeing family happy and content and fulfilled is the best thing ever. I LOVE your heart and your devotion to God. Thank you for sharing what should be on my list as well. As always you inspire me. Thank you. Now that I am giving though to before I die there are many things. The one that pushes to the front of my mind is I want to live my life in a way I do not have to talk about being a Christian but people can see it in my actions and etc. That is a perfect one—- I imagine it already is apparent! Shirley is a personal friend of mine (we’ve known each other since elementary school), and I can tell you that, yes, it is obvious that Shirley is a Christian by the way she lives her life! She’s a sweetheart! On consideration (for all of 1.5 minutes) I think my reply is too private (involving Mr. Privacy). Nice thought-provoking post anyway. Glad it made you think! Never need to share all here — privacy is of utmost concern. I’m not sure what my answer would be….lots of trivial things pop in mind, and some pretty deep ones too. It truly is a thought-provoking post. Trivial things are good! In fact I think we need to do more of those trivial things that mean something to us and not worry so much about it. My heart’s desire focuses first on my family. I want for them peace, happiness, freedom, faith, contentment, good health… The list could goes on and on. Written from a mama’s heart. Those are great things to have on your list. I agree. I really really would like to compile some of my poems into a book.